What is economic stimulus? If you ask enough economists that question you will quickly discover an abundance of very dry answers riddled with jargon that would put even ADHD victims to sleep. Economics has always been presented in a very intellectual manner with elegant charts and mathematical formulations that are supposed to show how the world works. In the scholarly world, economics is positioned as a social science that explains how production, distribution and consumption of goods and services work. * Why is there poverty? * Why does it always seem to get harder to make a living? * Why are there boom / bust cycles? * Does wealth flow from the top down or from the bottom up? 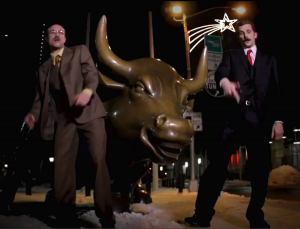 In their short film, Papola and Roberts tell the story of the most important economic questions through a hiphop rap music video. The two main characters are the world’s most prominent economic thinkers, John Maynard Keynes and Friederich von Hayek. Keynes’ legacy was his thesis that central planning of the economy is the main purpose and function of government. Friederich von Hayek, on the other hand, spent his life claiming that the greatest economic good would come about by government leaving economics and decision making to free markets, individuals and entrepreneurs. The top economic issues today include debt, central planning, jobs, currency devaluation, and more. With the recent downgrade of US debt by Standard and Poor’s to AA+ from AAA, this video is very timely and newsworthy. The authors have appropriately called it the “Fight of the Century”. Believe it or not, IDEAS matter. When the ideas have a good beat and you can dance to them, it’s possible to change the destiny of a civilization. “Fight of the Century” is the new economics hip-hop music video by John Papola and Russ Roberts at http://EconStories.tv.